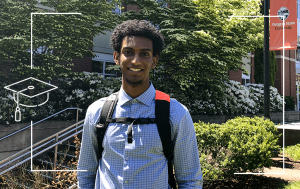 Looking back on his gut decision in high school to major in physics after taking a class in it, graduating senior Abe Teklu remains somewhat mystified. “I guess I was just really confident,” he laughs. Abe grew up around numbers and changing locations, moving from Ethiopia to Arizona at age six when his father got an engineering job at Intel, and then moving to Colorado before his family settled outside of Portland when he was 12. His family is mathematically inclined. His mom is an accountant and his dad, who not so secretly yearned to be a mathematician, is an engineer who reads calculus books and earned a master’s degree in fluid dynamics. This home field advantage explains some of Abe’s youthful confidence (he “loved math” even as a child) but since then Abe has carried the ball all on his own. At Oregon State as an Honors physics student, Abe has remained confident – at least most of the time – as well as comfortable with numbers and shifting contexts. He has had three research internships. The first was the summer after his sophomore year when he had a paid internship at Northwestern University’s Center for Interdisciplinary Exploration and Research in Astrophysics (CIERA) in Evanston, Illinois, in a rather niche but fascinating area of speculative research called astrobiology. There Abe analyzed mathematical models of theoretical predator-prey systems not limited to planet Earth. 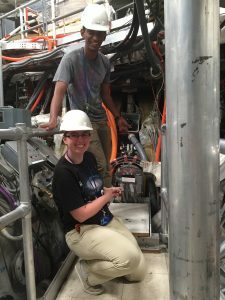 The summer before his junior year, Abe headed down to San Diego for another paid internship, this time at the U.S. Department of Energy’s DIII-D National Fusion Facility. The facilty consists of a tokamak, a magnetic fusion device which Abe describes as “a big metal donut spinning plasma to get fusion energy.” Abe used magnetohydrodynamics (MHD) theory to model plasma confinement, with the goal of understanding which conditions better spread heat flux in the divertor region. In his third research experience, Abe spent more than two years working in physics department head Heidi Schellman’s Particle Physics Research Group, analyzing neutrino-antineutrino data as part of the MINERvA, a major international research effort exploring matter-antimatter differences in neutrino physics. This involved aiming a beam of neutrinos from Illinois to South Dakota. Specifically, Abe worked on the recoil energies recorded when the rare neutrino-antineutrino reactions hit parallel strips of the scintillator, each of which is connected to a photomultiplier tube that determines how much energy is deposited in a strip. Abe’s research experiences beyond the classroom gave him many advantages. For one, the DIII-D fusion internship formed the basis for his senior thesis. He also learned valuable lessons about the nature of scientific work. Throughout his four years at OSU, community and relationships were key to Abe’s success, a sentiment reflected in his two top pieces of advice for new students. His second piece of advice? To wit, when Abe visited to Schellman during her office hours, she began describing her research and Abe just jumped in and asked if he could help. “That day she gave me a key to her lab and I started doing research!” Two years later, Abe still has a coveted seat in Schellman’s Lab and is currently mentoring a new student to take his place after graduation. It certainly did. Abe was accepted into the physics Ph.D. program at Stonybrook University in Long Island, New York, remarking with great enthusiasm upon the fact that there are no less than “60-70 physics researchers there!” Not wasting any time, he will jumpstart his graduate research this summer at CERN in Geneva, Switzerland, working on a yet-to-be-defined research project with his graduate advisor. 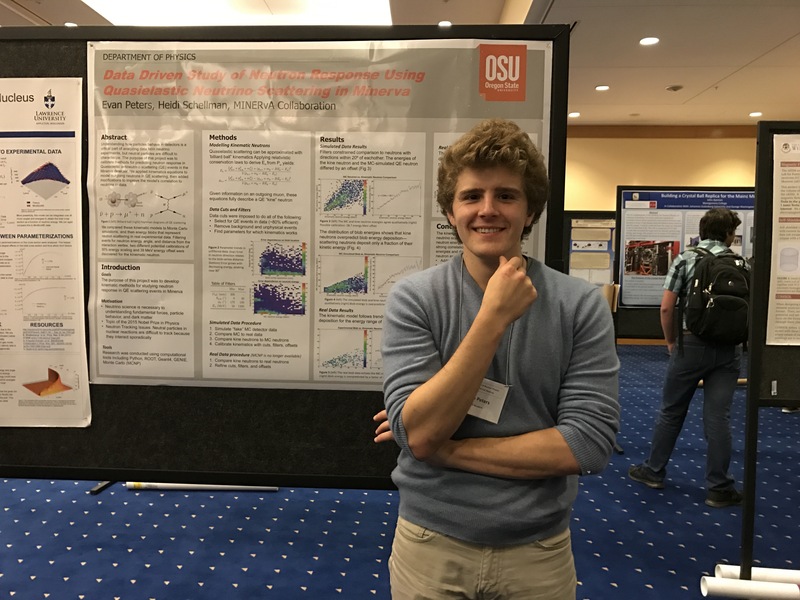 Abe is grateful for the science education he has received at Oregon State and was not surprised when he heard that the Department of Physics recently received a national award for improving undergraduate physics education. “All of my professors were great,” he said. The junior-year Paradigms in Physics series in particular, which was redesigned to include interactive pedagogies and real-world applications to better reflect how professional physicists think, was a real game-changer for Abe. Abe’s gratitude extends to the many scholarships he received that helped cement his choice to go to Oregon State. 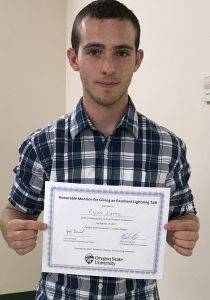 He received the university’s four-year Academic Achievement award as well as a freshman year Honors College scholarship, a Kenneth S. Krane Scholarship in Physics and a David B. Nicodemus Scholarship in Physics. Posted in Alumni, Research, Students, Teaching and Learning, Uncategorized, undergrad_research, Undergraduates. 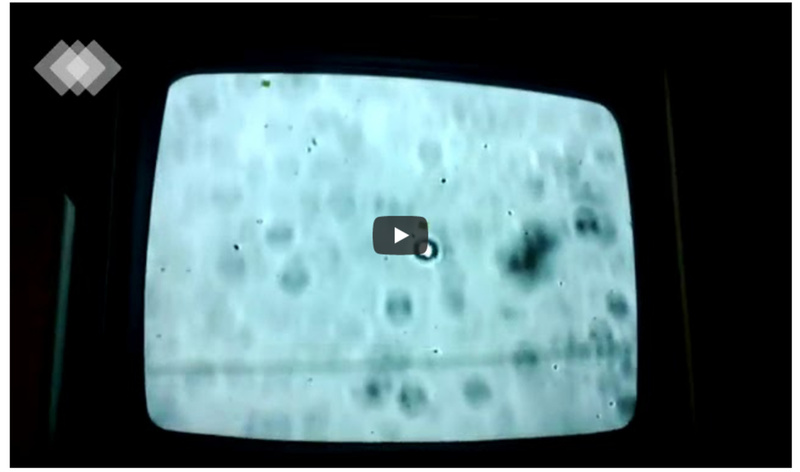 for a short summary of the paper and a short video highlighting the result. Posted in Alumni, Faculty, Graduate Students, Papers, Research, undergrad_research. Undergraduate summer research is hopping! OSU Physics undergraduates were busy in research labs all over the U.S. and the world during the summer of 2017. Many of them had National Science Foundation Research Experience for Undergraduates (NSF-REU) positions, others were working in laboratories in REU programs sponsored by other agencies, and some had industrial internships. All of them helped create new knowledge and they all had a wonderful time doing research! This level of participation in cutting-edge research by OSU undergraduates is very impressive – congratulations to all of you! Some of this work will be presented at seminars in the Physics Department during the year, so there will be an opportunity for the younger students to learn about the process and the fun of working in a research environment. Yousif Almulla participated in an REU program at Oak Ridge National Laboratory with Dr. Jacek Jakowski. He used density functional theory to understand how qubits work. Hassan Alnatah developed a protocol with Dr. Bo Sun of OSU Physics to construct a 3D printed cell model based on confocal imaging. Hazel Betz did an internship in the Fault Isolation and Failure Analysis Laboratory at Intel in Hillsboro, OR. She analyzed samples with a scanning electron microscope and designed to proof-of-concept experiments to improve device probing characteristics, and developed and documented procedures to improve the process. Mirek Brandt received a fellowship to study at the Kupcinet-Getz International Science Summer School at the Weizmann Institute in Israel. During his 8 weeks with Dr. Boaz Katz, he modeled the spectrum of type 1a supernova, given some arbitrary explosion model. The intent is to eventually test the supernova detonation models studied by Dr. Katz. Mirek highly recommends the program! Mirek then returned to OSU to take up his Goldwater Fellowship in the lab of Dr. Matt Graham of Physics. A very busy summer! Katelyn Chase participated in an NSF-REU program at the University of Utah in the group of Dr. Michael Vershinin in the Physics and Astronomy department. She studied the effect of Trimethylamine N-oxide (TMAO) on the stability of kinesin-1 motor proteins as a function of temperature. Aaron Dethlefs worked in Dr. Janet Tate’s OSU lab commissioning the new PPMS system in EECS for transport experiments on semiconductors. Patrick Flynn solved partial differential equations with applications to bacteria migration, with Dr. Arnd Scheel in the Math Department at the University of Minnesota. Ian Founds studied students’ use of the chain rule in thermodynamics with Dr. Paul Emigh and Dr. Corinne Manogue of the OSU Physics Physics Education Research group. Ian presented his work at the PERC conference this summer. Cassandra Hatcher had a SURE Science Fellowship to work with Dr. Davide Lazzati of OSU Physics. She studied X-ray polarization from Compton scattering in asymmetric supernova remnants. Garrett Jepson worked in Dr. David Roundy’s group in the OSU Physics Department. He evaluated a new Monte Carlo code written in rust for use in studying fluids. 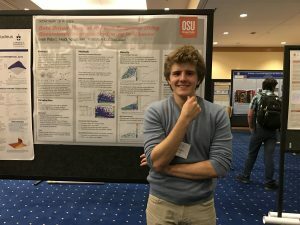 He also worked with Dr. Guenter Schneider of OSU Physics using machine learning techniques to locate and identify cells in a cell microscopy image. He has a SURE Science award to support his work. 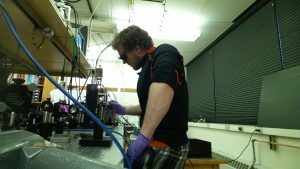 Ryan Lance developed a new analysis for optical spectroscopy of thin films in Dr. Janet Tate’s lab in the OSU Physics Department. He received an honorable mention for his presentation at OSU’s Summer Undergraduate Research Conference. Ryan shows his award in the picture below. Chris May, working in Dr. David Roundy’s group, developed an improved code for studying the Weeks-Chandler-Anderson fluid. Dublin Nichols is an OSU College of Science SURE Science fellow and this summer, he built a microscope rig that enabled him to stack atomically thin crystals for further study. He worked in the lab of Dr. Ethan Minot of OSU Physics. Gabriel Nowak had a Science Undergraduate Laboratory Internship (SULI) in the Atomic, Molecular, and Optical sciences group in the Chemical Sciences Division at Lawrence Berkeley National Laboratory (LBNL). He investigated laser-generated nanoparticle array formation and the dynamics of charge transfer in the process. Jesse Rodriguez modeled plasmas in the lab of Dr. Mark Cappelli of Stanford’s Mechanical Engineering Department. Nikita Rozanov characterized the interaction between cytochrome c and 3-mercaptopropionoic acid (MPA) coated gold nanoparticles using molecular dynamics simulations. He worked under the supervision of research scientist Dr. Caley Allen in the group of Dr Rigoberto Hernandez at the Johns Hopkins Department of Chemistry. This work was part of an NSF-REU at the Center for Sustainable Nanotechnology. 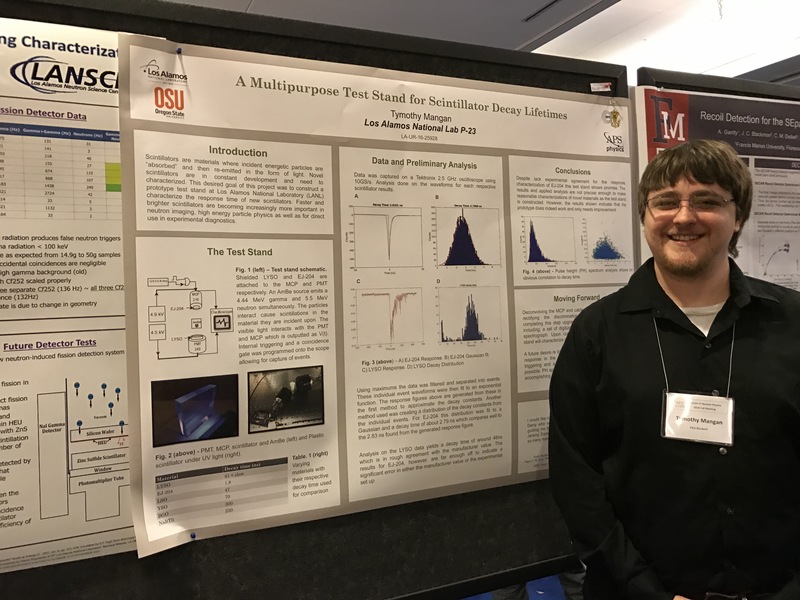 Tanner Simpson worked in Dr. David Roundy’s group testing broad histogram Monte Carlo methods using the square well fluid. He presented his work at OSU’s Summer Undergraduate Research Symposium. Abe Teklu was part of a DOE-funded program at General Atomics in San Diego with mentor Dr. Richard Moyer. Abe analyzed divertor footprints in the DIII-D tokamak to determine whether computational models describe the divertor region accurately. 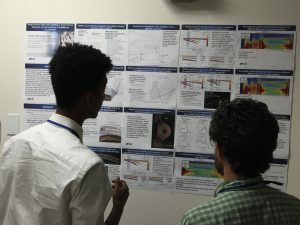 Here are pictures of Abe discussing his results at a poster session (below left, the taller person) and gathering data in the tokomak (below right, the person in the back row). Attila Varga had a SURE Science fellowship to work with Dr. Kathy Hadley of OSU Physics on modeling rotating star-disk systems. John Waczak tested and developed a model for the dynein motor protein worked in Dr. David Roundy’s group. Physics faculty also worked with students from other disciplines. Dr. Weihong Qui and Dr. Bo Sun, who both study biological physics, hosted SURE Science scholars Youngmin Park (BB) and Theresa Dinh (Biology) in their labs this summer. Physics students and faculty have received a total of 7 SURE Science Awards. The SURE Science Awards support an undergraduate student for a summer of research in a faculty member’s lab. Congratulations to all – we’re looking forward to hearing your reports at the end of the summer. Posted in Awards, Faculty, Research, undergrad_research, Undergraduates. 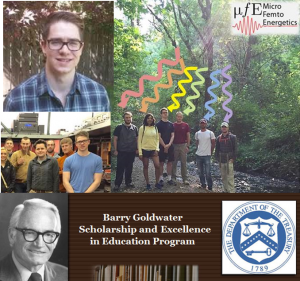 Physics Major Mirek Brandt was just named a National Goldwater Scholar! OSU’s last Goldwater Scholar winner was in 2013; most years there are only a couple successful nominations statewide (3 this year). OSU also had a second successful nominee this year, True Gibson, a Life Sciences major. Congrats! Mirek will graduate in June 2018 as a Physics and Math major and plans to pursue graduate studies. Since his freshman year (Fall 2014), Mirek Brandt has been a member of Prof. Matt Graham’s Micro-Femto Energetics Lab. His research contributions are very substantial and we thank URSA-ENGAGE and SURE Science Summer Scholarship programs for funding his research. He will defend his undergraduate senior project thesis later this year entitled “The Impact of Crystal Morphology on Opto-Electronic Properties of Amorphous and Organic Crystalline Materials”. To top off this National honor, Mirek was recently recognized internationally by being selected to attend the Kupcinet-Getz International Science School. This program matches top-undergraduates with leading research mentors at the Weizmann Institute in Rehovot, Israel. Mirek will join a Theoretical Astrophysics group at Weizmann this summer before returning to Oregon State Physics to take-up his Goldwater Scholarship. On behalf of the OSU Physics Department, congratulations Mirek! Posted in Awards, Students, undergrad_research, Undergraduates. Three Oregon State undergraduates went to the APS Division of Nuclear Physics conference in Vancouver BC in mid-October 2016. Undergraduates Gabe Nowak, Tymothy Mangan and Evan Peters gave posters on their work. Dept. Head Heidi Schellman gave a talk and provided transportation. All 3 students had won travel awards from the American Physical Society to cover their hotel costs. Evan’s poster was placed with theoretical posters presented by students also working on neutrino scattering, leading to much discussion among the neutrino community. Tymothy Mangan showing his work from Los Alamos last summer. Tymothy Mangan showed results from a test stand he built at Los Alamos National Lab last summer. Gabriel Nowak presented preliminary studies of Lorentz invariance that he did as a SULI student at Jefferson Laboratory. After the poster session we went on a tour of the TRIUMF nuclear laboratory at the University of British Columbia. Touring the ARIEL facility at TRIUMF. This room will be filled with equipment very soon. Posted in Research, Students, undergrad_research, Undergraduates. Another URISC Award for OSU Physics ! Congratulations to a physics major Alexander Quinn who received an Undergraduate Research, Innovation, Scholarship and Creativity (URISC) Award for Fall/Winter 2016-2017 sponsored by the OSU Research Office. Alex (pictured while performing experiments) will work with Prof. Oksana Ostroverkhova on a project titled “Investigating Xylindein, a Fungus-Derived Pigment, as a Candidate for use in Sustainable Optoelectronic Devices”. 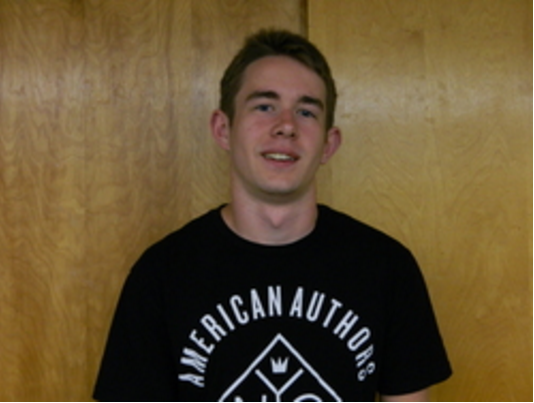 Alex is planning to graduate in the Spring of 2017 and continue his education as a graduate student in physics. His longer-term plan is to work in the area of sustainable materials and renewable energy. 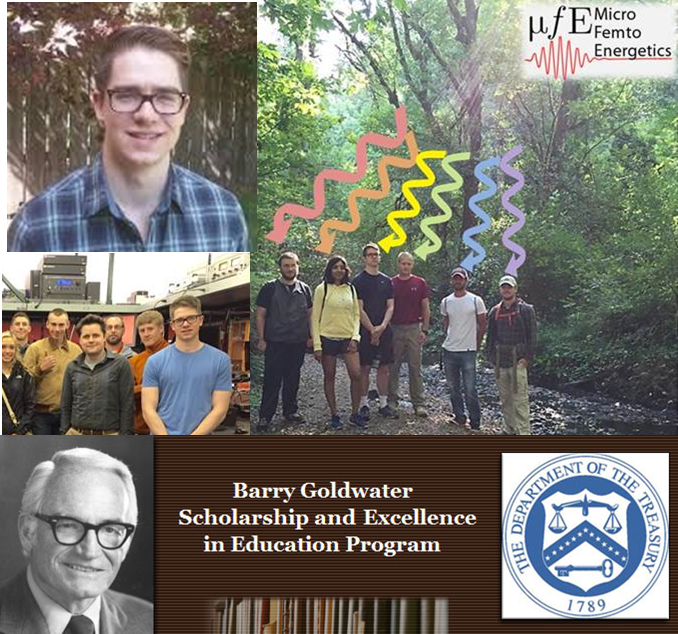 The Department of Physics is proud to announce that four undergraduate students are recipients of the Summer Undergraduate Research Experience in Science (SURE Science) Scholarships. 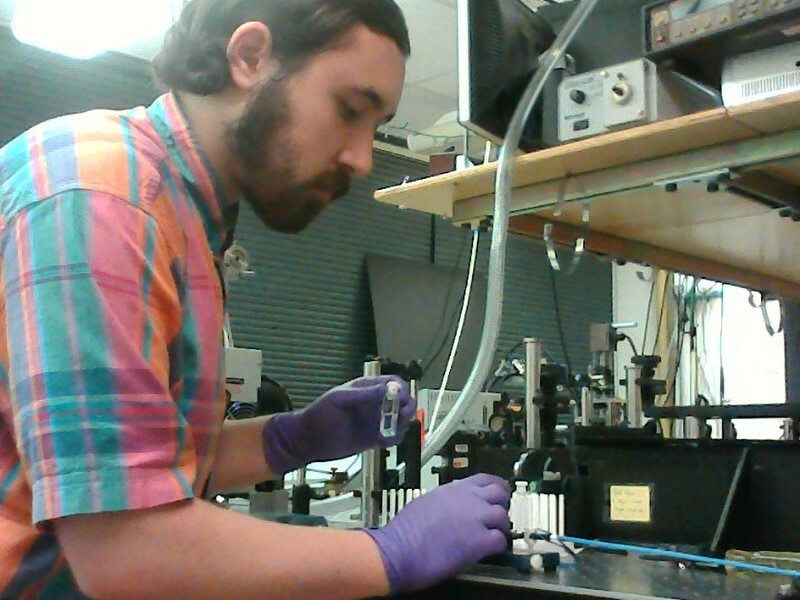 Jeremy Meinke will be working in Prof. Weihong Qiu’s Lab to determine how OsKCH2 –a nanometer-sized biological motor protein– moves on the filamentous microtubule track using high precision single-molecule microscopy. Mirek Brandt and Ikaika Mckeague-McFadden will be working in Prof. Matt Graham’s Lab on the novel electronic and optical properties of two-dimensional and organic materials. Katelyn Chase will be working in Prof. Bo Sun’s lab to develop microfludics endothelium-on-chips devices for studying the collective endothelium shear stress sensing during embryo development. Many thanks to the College of Science and to the scholarship donors that made theses full-time summer-Science research scholarships possible. Posted in Research, Students, Uncategorized, undergrad_research, Undergraduates. Congratulations to physics majors Ryan Bailey-Crandell and Jeremy Meinke who were chosen to receive Undergraduate Research, Innovation, Scholarship and Creativity (URISC) Awards for Winter/Spring 2016. The awards are sponsored by the OSU Research Office. A total of $18,000 was awarded to 15 undergraduate students whose proposals for independent research were clear and compelling. Ryan Bailey-Crandell (pictured on left) will work with Prof. Ethan Minot (Physics) on a project titled “Graphene Biosensors made from h-BN Heterostructures”. Posted in Awards, Research, Students, undergrad_research, Undergraduates.